KazuTime is a child friendly visual timer app created by Karine Pepin, Speech-Language Pathologist & Owner of Advanced Cognitive Communication Rehab Clinic; and Barbara Wichmann, CEO/CSO of ARTEMIA Communications, Inc. Kazutime is available in itunes or in your Play Store. 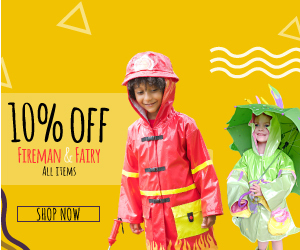 The founders of KazuTime worked extensively with children and observed first-hand the importance of structure and the power of fun in their daily lives. 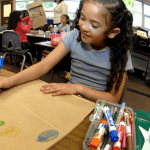 They understand that children benefit greatly from established routines and are more eager to participate when an element of fun is introduced. When inspired to start this project, Barbara and Karine noticed that the concept of time itself is often challenging for children to grasp. When time passing seems abstract, it’s no wonder that kids have trouble completing tasks within a time-frame, or that they are constantly checking in with their parents or teachers for updates as they try to understand the meaning of “15 more minutes” or “in half an hour.” Research supports the benefits of using a visual timer to help children transition between activities and understand the passing of time. Together, Barbara and Karine pulled from their individual and shared expertise to develop a tool that would empower children to better understand the passage of time. 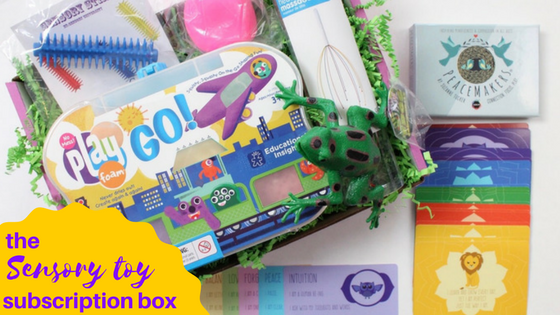 The entrepreneurs wanted to create something that was hands-on and useful, both for parents and for children. This app became KazuTime. KazuTime is an interactive program that features animated puppies playing – each of them specifically chosen for their loving, family-friendly characteristics. The app is a way for parents to teach the concept of time in a fun way, while maintaining the parent-child interaction without the stress and anxiety that can arise when there are time constraints or other scheduling challenges. “It was a natural evolution for us to team up,” said Barbara. 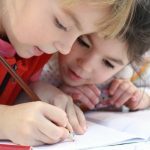 “We were able to take what we both knew about cognitive communication and education, and explore the idea of ‘what time is’ and how to help kids to actually learn and understand it.” Parents, grandparents, caregivers, babysitters, and educators can use this app to both empower children and to teach them about time, interacting through a fun, separate medium. KazuTime can be used to help a child understand how long an event or activity will last (e.g., work on homework for 20 minutes/we’re going to the park for 30 minutes), how long until something is over (e.g., we are leaving the party in five minutes), or in what amount of time something needs to be done (e.g., we need to be dressed and ready to go in a half an hour). Many children, especially young children or children with special needs have difficulty understanding the concept of a traditional digital timer or even an egg timer. Visual timers like KazuTime can really increase their understanding of time intervals. 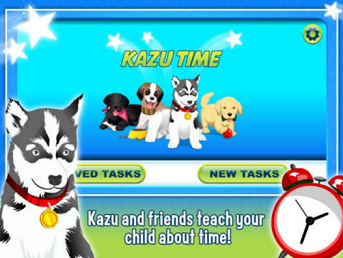 Unlike traditional timers, KazuTime illustrates and teaches time passing through its star puppy in an interactive and entertaining way. 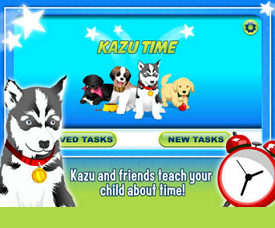 Layered with multiple cues that show time elapsing, KazuTime makes it easy for children to understand how time works. Children can use the KazuTime app to understand the length of time while they do activities like homework, music practice, getting ready for bed, dressing for school in the morning, or simply waiting for something. One of the ways time elapses in KazuTime is that two puppies run across a lake. When they get to the other side of the lake, the time is up. One puppy is a Husky named Kazu and the other, either Faby, Milly or Sammy, is selected by the child. Once the time is complete, the child is given shooting stars as a reward for getting through the time period. There is also a visual bar to signal the passing of time, a traditional timer, and a fading sky (when the color of the sky fades, the time is done). A sound that signals the passing of time and indicates when time is up, can be turned on or off. Users of the app can also take pictures of a task so the child can make a connection to what the timer is being used for. For instance, you can take a picture of your child doing homework and that picture will appear next to the timer as a reminder of what they are working on. Tasks can also be saved so you can easily pull them up without having to enter them in again. KazuTime’s distinctive “beginning,” “time elapsing” and “end of task” features allow children to pace themselves and help gauge the time needed to perform a task. Teachers can also benefit from KazuTime by letting children know how long an activity will last, how long they have before transitioning to the next activity, and how long a break will last. When setting up the timer their are five steps until the timer actually starts (e.g., choose length of task, choose your sky color, choosing the task, choose your puppy, choose the theme) so some children may need help to set the timer up if you want them to use it independently. Here is a video for you to see KazuTime in action! Kazutime is available on the IPAD, IPhone, or Android Devices. It costs $2.99, has a 4+ rating on itunes, and is made for children ages 3 and up. Have you tried KazuTime? 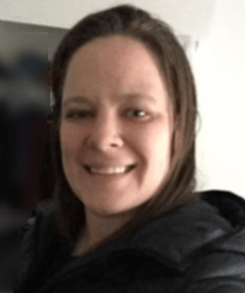 Comment below and let me know what you think of it. If you want more information, visit Kazutime.com or go to the app directly on itunes at Kazutime! Thank you for visiting educationandbehavior.com, a free resource for parents/caregiver, counselors, and educators! 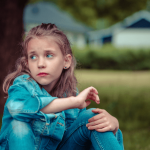 We provide free academic, behavioral, and social-emotional support strategies for children! Browse our topics/categories from the navigation bar above! Follow us on Facebook!